Mix salt into the masa harina corn flour. Then pour the oil into your water. Slowly pour the water and oil into the dough to get a good consistency. The dough should be soft, but not sticky, like a smooth butter cookie dough. If dough is still dry add a tablespoon more of hot water until you reach the right texture. Let rest for 30 minutes covered with plastic wrap. Preheat a griddle or flat surface. Divide the dough into 2 inch sized golf balls. Press dough between two pieces of plastic wrap or you can use a large zip lock bag and cut a circle larger than the tortilla press so that you have two plastic circles. Preheat you griddle so that the front burner is high heat and the back burner is medium high heat. Press the dough using the tortilla press and place flattened dough on the medium high heat griddle. Cook for 30-45 seconds then flip the tortilla onto the hot side of the griddle and cook for an additional minute. Flip the tortilla one last time until your tortilla puffs up. This shouldn’t take more than 20 seconds at which point your tortilla is done. Be sure to keep your tortillas in a tortilla warmer with a dish towel until ready to serve. Place eggs and half the ghee in a pot with a heavy bottom (to evenly control heat). Place burner on medium heat and using a spatula whisk the eggs until fully combined. Once fully combined add remaining ghee and continue to cook the eggs by periodically taking your pot on and off the heat for about a total cooking time of 5 minutes. It is important to constantly be stirring your eggs to ensure they never get brown on the bottom of the pan. Once you see the eggs are almost completely cooked remove pot from heat and add the sour cream to slow down the cooking process and make your eggs extra creamy and delicious. Sprinkle with a touch of sea salt and black pepper. Taste and adjust to your preference. Place sauté pan on medium high heat to heat oil. Once hot, add mushrooms and sauté until lightly brown and tender. Season with chili flakes, salt and pepper. Toss tomatillos, peppers, and onion in olive oil and season sea salt. Roast on a rimmed baking sheet 4 inches below a very hot broiler, until slightly chard and soft, about 5 minutes. Flip them over and repeat for another 5 minutes. Allow to cool for a few minutes, and then transfer vegetables and their juices to a food processor or blender. Add remaining ingredients and pulse until smooth or desired texture is reached. First sauté onions in a tablespoon of avocado oil, making sure you grease sides of your skillet. Once golden and brown add whisked egg whites, season lightly with sea salt and cracked pepper. Then place jalapeños down. Place on medium low heat for 7 minutes on stove top, then place into oven for an additional 10 minutes until eggs are no longer runny. Top with remaining ingredients and enjoy! Next take 10 eggs and crack them into a large mixing bowl. Using a manual hand eggbeater, beat eggs until you get some volume into the eggs. You want them to rise and look fluffy. Set eggs aside. Then, preheat a cast-iron skillet with some extra virgin olive oil, add onions and let cook on medium heat for 7 minutes. Allowing the onions to become translucent. Next take a 13x9 glass baking dish and lightly coat with olive oil. Take your skillet of sautéed onions and place them on the bottom of the dish. Add a touch more oil to your skillet and reheat to medium high heat. Then add your chopped mushrooms and cook for another 7 minutes, while mushrooms are cooking add the ground turkey sausage until it turns slightly brown. Add meat mixture on top of the onion. Then pour your egg mixture right on top of the meat mixture. Next layer your kale and green onions. Last, but not least, sprinkle diced ham on top of kale. Finish the dish with a drizzle of olive oil and a tiny sprinkle of sea salt. Place dish in oven and cook for 60-70 minutes, until eggs are fully cooked and not runny. Top with fresh cilantro and cracked black pepper. This dish stays good in the fridge for up to a week. I like to cut them into squares and save for breakfast on the go in the morning. Just reheat in oven or pan, top with a spoonful of salsa and your day just gets better! Enjoy! First, add oil into small skillet and allow to heat on medium high. Then add the shallots and sauté for 5 additional minutes. Next, drizzle asparagus with avocado oil, sprinkle with sea salt and pepper. Place the asparagus in oven for 15 min to roast. Once shallots have caramelized, add a touch more oil to the pan and pour in 3 beaten eggs into the pan. Using the flat side of the spatula mix the eggs around for 20 seconds with the shallots, then turn your heat to low and step away from the pan. Once your omelette is ready to be folded over (about 10 min, eggs should look firm with the top still a little uncooked) add asparagus, a handful of chopped basil, and arugula to half of the omelet and fold omelet over. 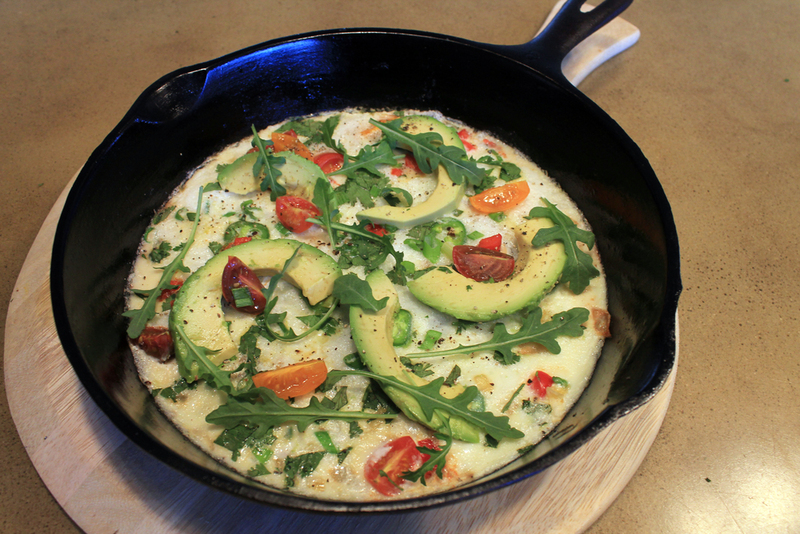 Carefully remove your beautiful omelette from your skillet, sprinkle with fresh basil and enjoy! This is a breakfast fit for champions! If you’re trying to impress someone at 9am give this recipe a try! 1. Mix all the ingredients except for fruit together in a glass mason jar. Stir well, cover, and refrigerate overnight. 2. The next morning, remove from the fridge, top off with your favorite fresh fruit and enjoy! First steam cauliflower for 15 minutes, let it drain or pat dry, then puree in food processor until smooth and creamy. Add cottage cheese and pulse until smooth. Transfer mixture to large mixing bowl and add in remaining ingredients one by one until fully combined. Let mixture stand for 5 minutes before making waffles. Heat your waffle iron and grease with coconut oil. Once hot add 3 heaping tablespoons of your batter to your iron and let waffle cook for 7 to 10 minutes. I like to top my healthy sweet waffles with fresh berries, my cinnamon crema and a extra sprinkle of cinnamon!